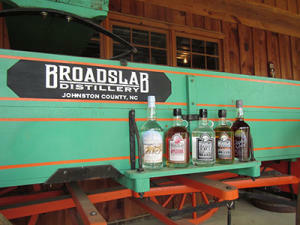 Broadslab Distillery in Benson, NC. The Johnston County Beer, Wine, and Shine Trail continues to expand its offerings and, thanks to the NC Legislator, can now offer more spirit than ever before. As of October 2015 Broadslab Distillery can sell tasting room visitors a bottle of their smooth shine. Due to antiquated liquor laws, selling on-site had not been a possibility before. And you&apos;ll certainly want to pick-up a bottle! With real wooden barrels, a copper still, and corn growing in the field, Broadslab Distillery crafts an authentic taste from a recipe that is five generations old. Also along the trail are regionally celebrated, craft beer newcomers Deep River Brewing Company and Double Barley Brewing. Using local ingredients like sweet potatoes, watermelons, and corn, both breweries offer a variety of beers and come with high praise. Let&apos;s not forget award-winning Hinnant Family Vineyards and picturesque Gregory Vineyards. Both offer vineyard tours and tastings. Better yet, the brand new Beer, Wine, Shine, and Dine Tour opportunity offers ticketed guided tours of the trail at certain times throughout the year. You enjoy all the delicious drinks and they&apos;ll drive you around. Cheers! - beerwineshinetrail.com. This picturesque 135 acre working farm showcases hill of planted vineyards, a winery, a distillery and a tasting room open seven days a week. Please visit Doctor Lane Gregory and his merry wine makers. Enjoy a taste of double gold winning Mary Elizabeth, double gold winning Lee Love or other award-winning wines. Relax while sitting by the fireplace or grab a rocker on the front porch. The Hinnant Family Vineyards staff invite you to take a gander at the oldest and largest Muscadine vineyard in the state, sprawling 100 acres. In the tasting room sip on double gold winning Electric Pelican, Bob&apos;s wine of choice! Johnston County&apos;s first legal brewery opened in April of 2013. Many of their beers include locally sourced vegetables, fruits, hops, and grain. The historic space they occupy in downtown Clayton was a cotton spinning mill is brought back to life by utilizing old barn wood on the walls, mason jar lights, and whiskey barrels for tables. Deep River Brewing Company has become a staple for locals and is perfect for those looking to enjoy a fresh craft beer in a casual laid back atmosphere. Taste a vast variety of craft beers such as crowd favorite, Wilma&apos;s Wandering Eye PA. The rustic with modern twist taproom is the perfect relaxed environment with lounge area, patron bar, founders table and high top tables. Make sure to try new appetizers with your cold beer. The outdoor beer garden is shaded by trees and sun sails. Imagine listening to music while kicking back in comfy chairs and chilling out with your friends. Makes you want to hang out all day! Broadslab has now opened the distillery to the public for tours. During one hour tours, visitors will learn about the all natural, handcrafted premium products, how and why they make them, and receive a free shot glass and tasting. Tour cost is $12. Visitors must be 21 and ID’s will be checked prior to the tasting. Children are welcome to join you, but they must be accompanied by a parent or guardian.